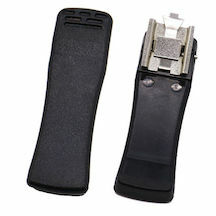 CLIP8923 : Heavy-Duty spring-loaded Belt Clip for Motorola XTS5000, XTS3500, XTS3000, XTS4250. Fits battery models NTN8923, NTN8294, NTN9858, RNN4006, etc. Pricing is for 1 belt clip. Picture shows front and back of belt clip.